Crete is a great destination for families of all ages but every parent dreads the statement ‘I’m bored!! In both Chania and Rethymnon there’s no need to worry about not finding a suitable diversion for both young kids and teenagers. When a day spent around the pool doesn’t appeal, the beach and its many attractions maybe an alternative but may be a few hours spent doing something different may be a good idea for a complete change. On these days there are lots of things which will entertain all members of the family. Waterpark - Limnoupolis This great water park is set in a fabulous countryside setting away from the busy resorts of Chania. 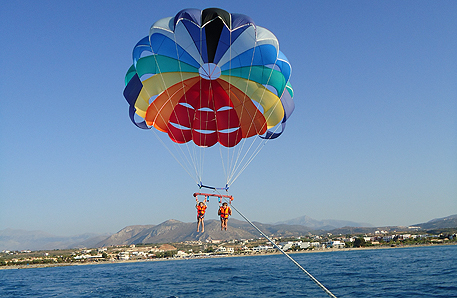 It’s 8 kilometres from the town of Chania and has a variety of rides from Kamikazi to the Lazy River. Go Kart Tracks There are several go kart tracks suitable for children in the resorts of Chania and Rethymnon. They are smaller tracks and smaller karts geared especially for budding Formula 1 drivers! Ten Pin Bowling There are two Ten Pin Bowling alleys in the Chania area for days when all the family want to escape the sun baked beaches. Play Park Several play parks are dotted around the resorts for young members of the family to let off some steam whilst mum and dad keep watch from the comfort of a chair. Bouncy castles, ball pits, padded adventure playgrounds etc. Road Trains These mini train type vehicles run between resorts all over the island taking visitors for a ride at a leisurely pace for a couple of hours at a reasonable cost. Mega Place This is a great complex in Chania where children can let their hair down with a variety of play areas all under one roof. Aquaplus Aquaplus water park is split into two connected sections,one for adults including the extreme slides and the other beng for children.The slides are set amongst gardens full of cretan trees and exotic flowers.The park offers from 50 slides, games and catering facilities.They use a cashless bracelet scheme and have a system setup to reduce the waiting time for the slides.Sunbeds and umbrellas are included in entry price. Georges Mini Golf Georges mini golf has an 18 hole course set among a garden area. The site also has amusements such as air soccer and a cafe/snack bar. Watercity Has a large variety of slides, pools and of course a Lazy River for those who prefer a more sedate pace. The Cretaquarium Gournes The Cretaquarium in Gournes is also worth a visit. Come face to face with hundreds of species and get a glimpse of the Mediterranean Sea and the life it supports. Hersonissos Go-Karting Go Karting is available close to Star Beach Water Park so lots to keep all ages happy! Golden Fun Park Golden Fun Park is the largest entertainment fun park in western Crete, offering an array of activities. It offers 8 bowling lanes, an 18-hole minature golf course, indoor and outdoor children's playground and a snack facility. It is easy to get to! in the area of Agious Apostolous and around a 5 minute drive from the resort centre. If you drive from Platanias or Agia Marina then it is about a 10 minute drive. This is a great place for a fun, family day out! Labyrinth Park As the name suggests this is a maze where the objective is to find the centre and the Minotaur, then find the escape route!! Its great fun for all the family and the route is changed regularly. It's a 3D maze with steps and bridges too just to make it more interesting! Along the way visitors will learn more about the myths and legends surrounding the famous Minotaur of Knossos.